I’m trying to keep myself awake until a reasonable time (goal is 9pm) so I thought I’d post a little update. I’ve been a little quiet here for a few reasons. Work got nuts. I’ve worked an extra 12 hours in the last two weeks! My diet has been totally off track. I’ve hardly been running because my allergies and asthma have been terrible. I’m in a fitness slump. I’m trying to work through things on day at a time. Today, I did yoga. It was awful. I had no idea I was so out of shape. Also, I highly recommend wearing pants and a shirt while yoga-ing. I did it in sports bra and underwear, and let me tell you, the view from downward dog is the worst angle I’ve ever seen of myself. My gut was a huge flap hanging from my abs. Thighs didn’t look much better. I guess it could be motivating if you like reminders of how fat you look at odd angles. This afternoon, I finally went to buy my new running shoes! Now that’s a true motivator. All of my real running shoes have been Mizuno. I love the way they lock my heel in place. My first pair that I bought last May were the Wave Inspire. It was the first time I got fitted for shoes and the store employee told me I had one foot that needed a little support so I ended up with the mild stability Inspire. They felt so much better than the K-Swiss Tubes I had been running in for a year and a half (no joke, I even ran my first half marathon in those Tubes! ), that I didn’t realize they weren’t the best fit. After a long run on the hard pavement in Chicago last September, the outsides of my feet, near my pinky toe, was getting really sore. Like it was bruised on the bottom of my foot. 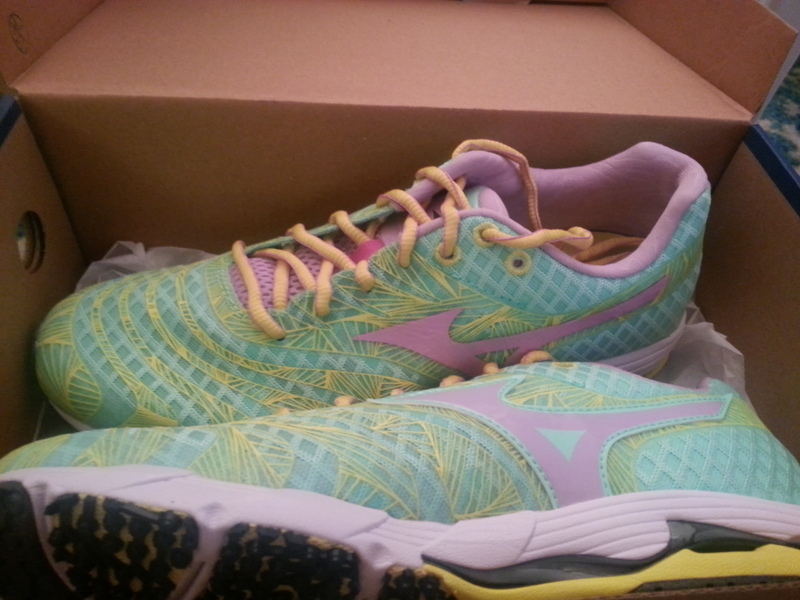 I did a little research and decided to try out the Mizuno Sayonara instead. I went into my local Fleet Feet store, ran a loop around the parking lot in them and was sold! I wore these all last fall and winter, for 2 5K’s, one of which was a PR, and a 10K on my 1st wedding anniversary. But in the last few weeks, I’ve been starting to get that outside foot pain again and I noticed that the foam was getting pretty thin inside the shoe. I have no clue how many miles are on them – my best guess is about 400. So it’s time to retire them. Since I’m now training for a full marathon, I thought I might want to give a more substantial shoe a try. 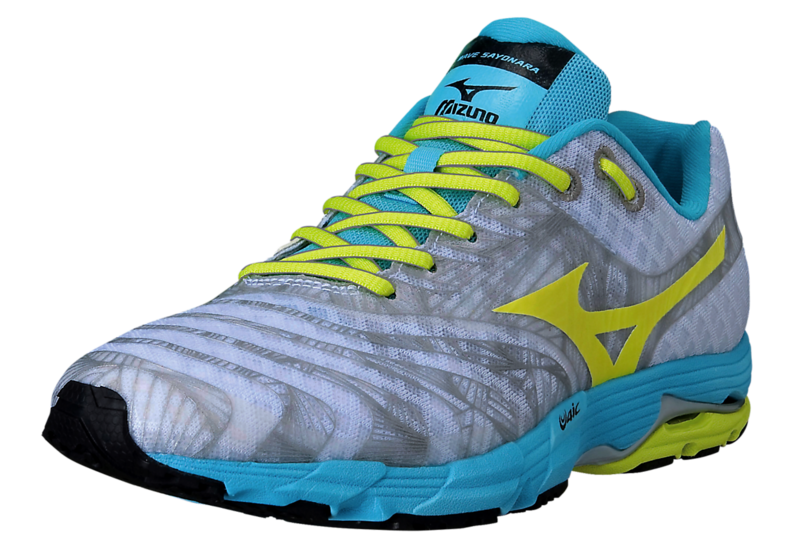 The Sayonara is a super lightweight shoe and has sort of a minimalist design to it. It’s not usually recommended for long distances (although I’ve run 10 milers in them with no problem). So when I went in to Fleet Feet today, I first tried the Wave Rider 17. It was really cushy and comfortable, but when I ran in them, they were just too bulky for me. I love feeling the ground beneath my feet and having space for my toes to breathe. So I ended up with another pair of Sayonara’s. This time in the tacky-cute color combo of Cabbage/Orchid Bouquet/Aurora. It was better than black and white and purple which looked kind of manly. I haven’t taken them on a run yet, but for the short time I wore them in the store parking lot, I could tell the fit was nearly identical to my old Sayonara’s (the heel actually fits even better in the new ones!) but there was so much more cushioning. I had no clue how flat my old shoes had gotten! So I’m excited to give them a spin tomorrow morning. And I’m hoping to buy one more pair (maybe online?) of the old grey/blue/green color combo that I love so much. It can’t hurt to have two pair when you’re running 30 miles a week! Last little tidbit. I’m really hoping to get back on track food-wise. We’ve got about $40 left in the grocery budget to last us the rest of this week. Just enough to buy some breakfast and lunch essentials, and produce to go along with the meat in our freezer. Next week, I’m detoxing again. 3 days of vegetarian, 4 days of clean eating. NO SWEETS! I’ve gotta do it. I’m tired of feeling fat and lazy, my skin looks awful, and even my sleep patterns are off. Plus I can’t fit into a really pretty skirt I bought on vacation. It’s time to get it together. Okay, one more tidbit. One of my friends is in town from London, Ontario. She knows a lot about free weights. I know nothing. I stick to the machines at the gym. I do know that I’ll get a much better workout using free weights than machines. So she’s agreed to come to my gym with me this week and show me what to do in the free weights area! I’m so excited. Ah! Third tidbit. I’m going to the doctor next week to get medicine for my allergies and asthma. Finally I’ll be able to breathe when I run! Alright, it’s 9:45. It’s late enough to go to bed. Hope you all had a great Memorial Day weekend! Anyone else need to get back on track after a little overindulging?? 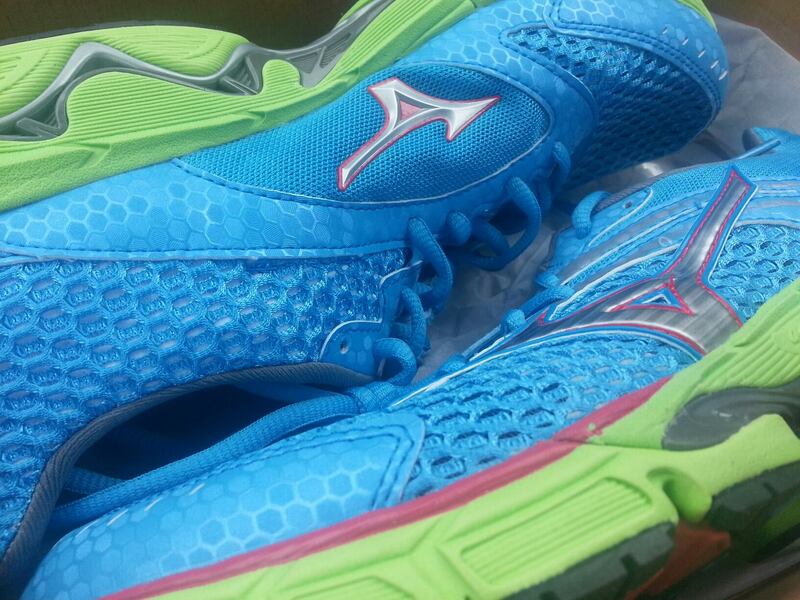 I love Mizuno, and really enjoy the Riders 16 for longish runs. Glad you found a new pair that works for you. I sooo hoped that I’d be able to wear the Riders for long runs. The extra cushioning would’ve been nice! In the end, I just love the lightness of the Sayonara. gotta love Mizuno!